P&P Windows are proud to design, manufacture and install state-of-the-art aluminium doors, windows, conservatories and bi-folding doors. Our products combine superior design with sleek, innovative features, coupled with glazing that ensures maximum security and minimal heat loss. Strong, slim and light-weight, aluminium can be formed, bent or shaped to create a bespoke product that will enhance the appearance of your property and potentially add value. Tough and resistant to rust and corrosion it's virtually maintenance free, making it the premier solution for use in areas with heavy wind, rain or other natural elements. As authorised partners of ALUK, our products undergo rigorous testing to ensure that they perform to the highest standards. Peace of mind can be assured with the knowledge that all aluminium products are enhanced with multipoint locking mechanisms and locking handles. Our doors and windows are tested to PAS24 for enhanced security and most are certified under the 'Secured by Design' scheme, where applicable. From traditional to contemporary, our product range is extensive and offers systems to suit all applications. Choose from a wide choice of styles and colour finishes, or mix things up and opt for dual colour instead! Bi-folding doors are all the rage at the moment, they offer all the benefits of traditional patio doors, but with added advantages! 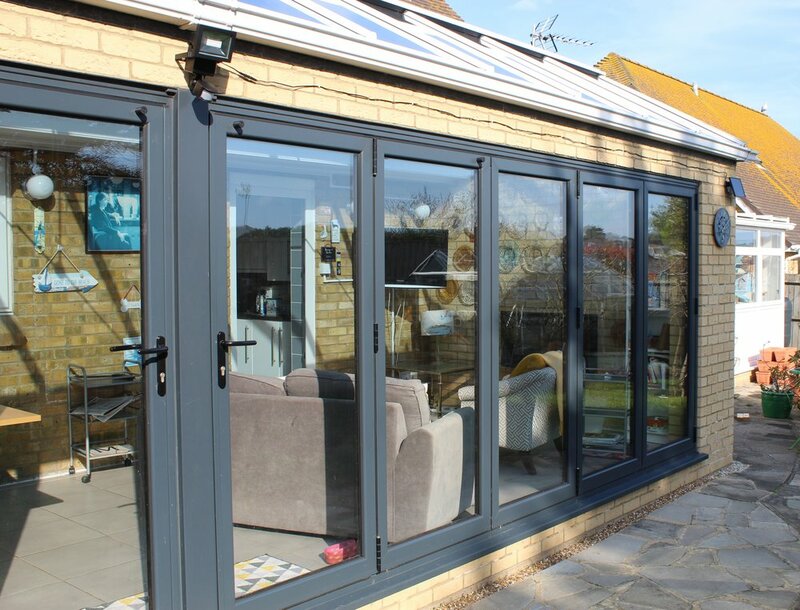 Not only are they a stylish alternative to traditional sliding patio doors, they can also create an open, flexible and modern living and working environment. These uniquely designed bi-folding doors open effortlessly giving you more than 90% opening and use a uniquely designed pop-out T-handle that allows for very tight stacking panels. And low threshold options allow for flush floor levels and reduce the step-over. The bi-fold system used is ALUK which exceeds current and future standards for efficiency, security and performance. Available in a range of styles and designs, doors and panels can be used in any configuration all of which are available in both open-in and open-out options. We can even replace entire walls to maximise your opening space and you can colour co-ordinate your doors with a huge range of colours and optional colour matched handles and hinges. Doors are also available with Self Cleaning or Solar Control glass and integrated blinds can be added for privacy and style. P&P Windows high performance bi-folding doors exceed October 2010 building regulations. Fitted with toughened safety glass as standard, they are weather resistant and fitted with high quality hardware. Designed for ease of use, bi-folding doors run on four bogie wheel assemblies that travel on twin stainless steel tracks. The bogie wheel assemblies have a dedicated guide that provides improved stability, resulting in easy graceful operation. 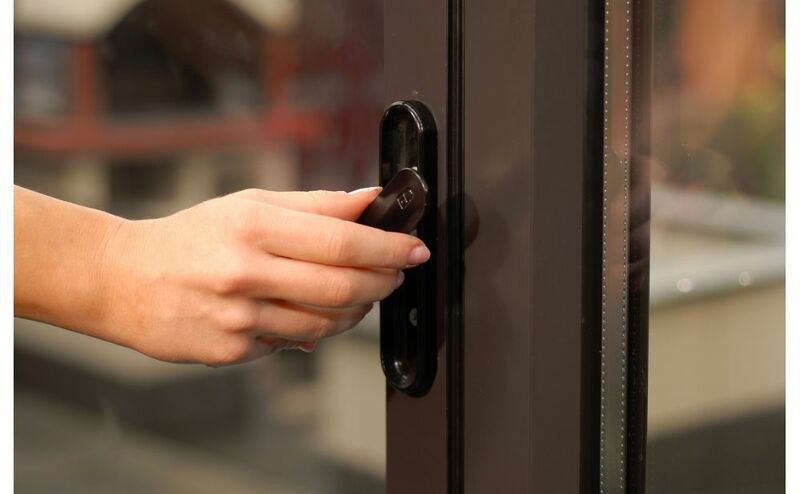 Tested to PAS24 for enhanced security, all intermediate doors have heavy duty shoot bolts that secure the doors top and bottom and are operated by T-handles. Traffic doors have high security multi-point locking consisting of two substantial hook locks, latch and dead bolt. We also fit an extra-high security anti-snap, anti-bump locking cylinder as standard. The dedicated guide on each of the bogie wheel assemblies runs within the outer-frame, preventing the doors from being forced out of the frame.